a-very dark brown, light crimson edge to it. pillowy, cream colored foam. whole lotta lacing going on. s-bittersweet chocolate malts and oatmeal dominate. slightly nutty as well. t-the bittersweet chocolate, again. with the oats. not too big, but by design. light toffee and caramel notes. an aromatic chocolate lingers. m-silky smooth. moderate carbonation, gently effervescent and creamy. d-not ng's best work, but very solid. they rarely strike out, but this is at least a solid base hit. i am happy with this one, but not thrilled. a wonderfully sessionable stout. This pours a dark brown color with a slight head. The aroma is sweet and malty. The taste is nice and complex with molasses, toasted oats, and hints of coffee. This is a smooth, well-balanced stout that really delivers. The after taste is a little bitter with a lingering oat flavor. Received as an extra with a trade from LegitCraftBeer so thank you very much for this nice beer. A very nice looking beer. Pours a very dark brown. Nice 2 inch head that quickly died down leaving behind heavy lacing. Looks like how I want my beer to look. Smell was nice had a nice roasted scent to it with a hint of chocolate. Good taste with the chocolate up front and the roasted oatmeal seemed to linger on my tongue for quite sometime. 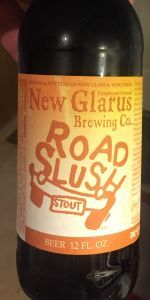 I liked this beer I had Velvet Merkin last week and I prefer the Road Slush. Got in a trade from dzyneguru...thanks man! Poured from a 12oz bottle into my Portsmouth snifter/tulip. Pours a heck of a lot lighter in appearance than expected...for a stout. A mild caramel brown color, but as it fills the glass, the final color is an extrememly dark and murky brown. A very healthy size head rises...frothy and tan...with very decent retention. As it dissapates, leaves patchy and sticky lacing. Aroma is mild, but sweet, a little malty, and mostly coffee like. That's about it...a rather faint aroma. Flavor is ok...coffee notes, slightly malty, and thats about it. Not a very exciting beer. Almost tastes watered down with the high carbonation. Not boozy at all. Light mouthfeel. More coffee in the aftertaste then the actual beer taste. Of course, as it warms, it gets slightly better...but not much. Overall a pretty average stout. Reviewing from last months notes. Poured into a pint glass. Received as an extra from oach - thanks! D: This beer is... ok. Smell and taste leave something to be desired. Overall a decent stout, but not one I'd actively seek out again. Road slush pours black with a big lacing head. There is a big rich malty aroma, with sweet notes. The taste has a hint of smoke and a hing of chocolate, lots of sweet lactose flavors. A little watery, but still nice flavors. Overall its a very solid stout, not fancy, just straight forward. Thanks to EliteDigger for this one. Super black opaque in appearance with a nice sized tan head. Smell is sweet toasted malts. Coffee, bitter chocolate, bitter hops presence. Alcohol comes through a bit. Taste is just like the aroma; Bittersweet chocolate, black coffee. Finishes with a nutty, alcohol dryness. Very tasty & drinkable brew, not too sweet or richly overwhelming. Very dark brown, with a tan head that dissolves into a patchy coating. Coffee grounds up front, with some faint hints dark chocolate and cocoa. Wet coffee and moderate amount of dark chocolate. Mild bitterness on the finish. Fairly smooth, with some wet bitterness at the end. Fairly drinkable, but bland enough to be fairly forgettable. A - My pour was a little over the top, so out sprouts a 4+ finger light brown head that is bubbly, frothy and slowly craters as it dies down. The lacing is a bit ridiculous; super sticky and goopy. It's sticking to every part of the glass. The beer itself is a menacing looking black with purple and brown tints. S - Some nice medium roast, some tootsie roll, yeast, a little milk chocolate and cocoa.Somewhat low aroma overall. T - Rich, tasty roast, honey, milk chocolate powder, charred wood, some coffee grounds and an estery yeast character, and the tootsie roll found in the smell is still floating around in the flavor. The flavor in the finish falls flat and isn't helped by the thinish body and slight undercarbonation. There really isn't any depth at all past the initial taste; the finish is pretty boring. M - Easily the worst part about this beer. See taste...tldr; too thin, undercarbonated and it really detracts from an already weak finish. O - Not bad, not great. I will give this stout points for being incredibly easy to drink; it wouldn't offend anyone and would probably be a great option for someone new to the style.